Please refer to your Tax Talk Dated 08.04.2013 which was very informative. In continuation to that, we have been told that there are changes on the taxability in the hands of builders also if the flat/office block/ etc are sold at a price lower than the Stamp Duty Valuation. As of now, we are liable to pay tax on the basis of actual sale price and not on the basis of the Stamp Duty valuation. Is it true? Whether the income tax would be applicable on the basis of the value which may not have been received by us? What is the remedy available? Is there any exception to this provision like date of agreement as mentioned in the last issue of Tax Talk? So far, section 50C (which provides for taxability of property on the basis of higher of Stamp duty valuation or the actual sale consideration) is applicable only when the capital asset is sale. It don’t have any application if the assets sold is not a capital assets i.e., it is not applicable when the stock in trade is sold by the tax payer. In short, Section 50C is not applicable to the builder since in most of the cases the assets/property is the part of stock in trade and resultantly the profit on sale of assets was taxable on the basis of actual sale consideration and not taxable on the basis of Stamp Duty Valuation of the property. To bring land or building or both held as business assets within the scope of stamp duty value based taxation, the Finance Bill-2013 has proposes to incorporate a new section 43AC in the Income Tax Act-1961. 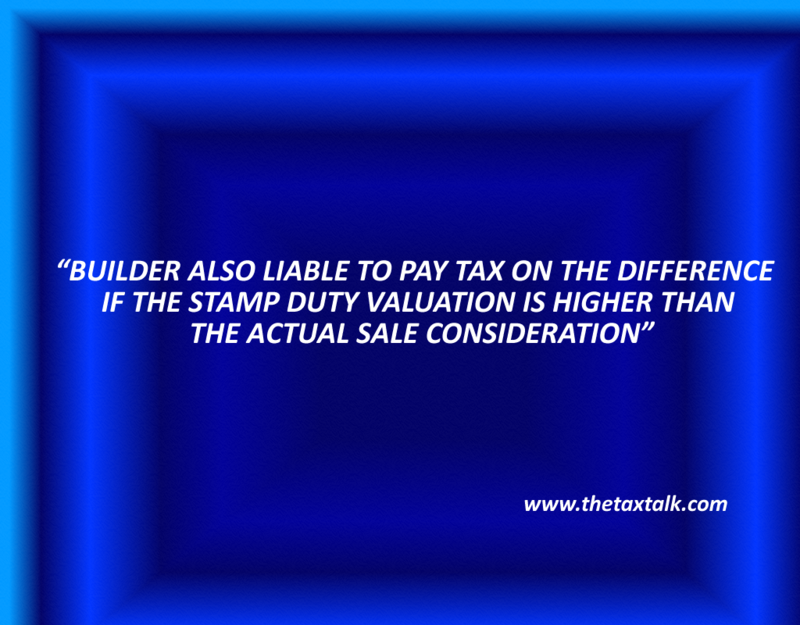 As a result of proposed insertion of Section 43AC, even the immoveable property forming the part of stock in trade would be taxable on the basis of Stamp Duty Valuation or Actual sale price, whichever is higher. a] It is provide that where the tax payer claims before any assessing Officer that the value adopt or assessed or assessable by the authority under section 43CA(1) exceeds the fair market value of the property as on the date of transfer and the value so adopted etc by the authority under section 43CA(1) has not been disputed in any appeal or revision or no reference has been made before any other authority, the assessing officer may refer the valuation of the assets to the valuation officer. Where the value ascertained on reference to valuation officer exceeds the value assessed by the stamp valuation authority, the value so assessed shall be taken as the full value consideration. b] It is also proposed that where the date of an agreement fixing the value of consideration for the transfer of the assets and the date of registration of the transfer of the assets are not same, the stamp duty valuation may be taken as on the DATE OF THE AGREEMENT for transfer and not as on the date of registration for such transfer. However, this exception is applicable only where amount of consideration or part thereof for the transfer has been received by any mode other than cash on or before the date of agreement. It’s true that the definition of Agricultural land is proposed to be amended by the Finance Bill-2013. Presently, Rural Agricultural Land is defined to mean land not situated in any area within the jurisdiction of a municipality or cantonment board having population of not less than ten thousand or in any area within such distance not exceeding eight kilometers from the local limits of any municipality or cantonment board as notified. For that purpose, the Central Government had issued Notification No SO – 9447 dated 06.01.1994. In that notification, more than 400 cities have been listed and corresponding relevant distances have been mentioned. Any transfer of agricultural land falling within the relevant distance of the cities mentioned in the notification would be subject to capital gains tax. C] 8 kilometers, from the local limits of any municipality or cantonment board and which has a population of more than 10,00,000. It is now further clarified that the distance has to be measured aerially. The amendments are proposed to take effect from 1st April, 2014 & will accordingly, apply in relation to assessment year 2014-15 and subsequent assessment years. Previous articlePURCHASING THE PROPERTY BELOW THE STAMP DUTY VALUATION IS TAXING NOW!